Woodwind & Brasswind (wwbw.com) offers orchestral and student instruments, including violins, cellos, trumpets, flutes, and clarinets. Cash back is not available for Gift Cards, or orders that take place through a call center or store associate quote. 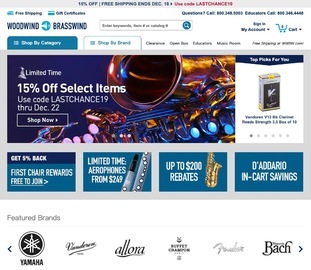 Click a Coupon or click Start Shopping to earn 5% Cash Back at Woodwind & Brasswind.